In a pejorative manner, clericalism is often used to denote ecclesiolatry, that is, excessive devotion to the institutional aspects of an organized religion, usually over and against the religion's own beliefs or faith. This means that all issues, even those that may be beyond the religion's jurisdiction, must be addressed by either clergy or their supporters. Clericalism is also used to describe the cronyism and cloistered political environs of hierarchical religions, usually Christian denominational hierarchy, and mainly in reference to the Roman Catholic Church. 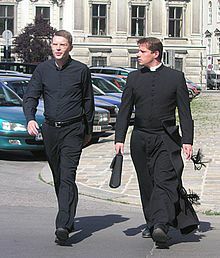 The phenomenon of clericalism is not restricted to the ordained (e.g., priests, ministers), as it occurs in purely secular guilds, such as academia, the legal and medical establishments, and the public-safety clergy: the police and military. Outside of Catholicism, clericalism is used to denote the divisions between ordained clergy and lay leaders in some Christian denominations while the older meaning of the term—an application of church-based theory or thought to secular issues—seems rather lost in most current uses of the term. In the aforementioned use of the term, it is important to discern the difference between a belief in a separation of church and state—which is not truly involving of clericalism—and the belief that church leadership should not be an internal and cloistered body that answers only to itself or that such leaders should not act as a powerful force in matters beyond the internal concerns of their church. Much debate in recent years over the sexual-abuse scandals in the Roman Catholic Church has brought about charges of clericalism in the sense of bishops and other leaders covering up the wrongdoing of clergy under their leadership. In this application of the term, clericalism has come to mean a division between ordained church leaders—that such leaders have an exclusive society unto themselves—and the lay followers. "The reason that the 19th century French statesman Léon Gambetta said that “clericalism is the enemy” was because he saw freedom from ecclesial power as the principal objective in the battle for public freedom." Clericalism arises from an elitist and exclusivist vision of vocation, that interprets the ministry received as a power to be exercised rather than as a free and generous service to be given. This leads us to believe that we belong to a group that has all the answers and no longer needs to listen or learn anything. Clericalism is a perversion and is the root of many evils in the Church: we must humbly ask forgiveness for this and above all create the conditions so that it is not repeated. For the priest who is vulnerable to clericalist narcissism, and to the bishop embedded in it, the interpretation of ontological change that posits an actual merger with the being of Jesus Christ at the moment of ordination can support a belief that clergy are called by God to be inherently superior to other human beings. Yea, the priests and the monks are deadly enemies, wrangling about their self-conceived ways and methods like fools and madmen, not only to the hindrance, but to the very destruction of Christian love and unity. Each one clings to his sect and despises the others; and they regard the lay-men as though they were no Christians. This lamentable condition is only a result of the laws. ^ Matthew Feldman; Marius Turda; Tudor Georgescu (31 October 2013). Clerical Fascism in Interwar Europe. Routledge. pp. 227–. ISBN 978-1-317-96899-3. ^ "Urban Dictionary: Clericalism". Urban Dictionary. Retrieved 2019-02-21.